Richard Devine is an electronic musician releasing on Warp, Schematic, Sublight and Detroit Underground among the many labels. 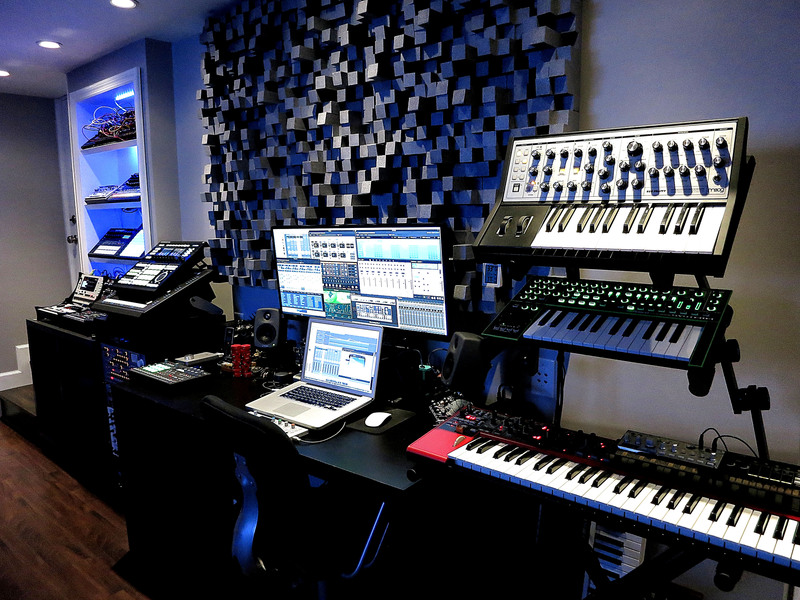 As a sound designer, he’s created patches for Korg, Native Instruments, Clavia, and most recently film, video games and many other hardware devices. In August of 2013 he released The Electronic Music Manuscript: A Richard Devine Collection – a construction kit for Sony’s Sound Series. 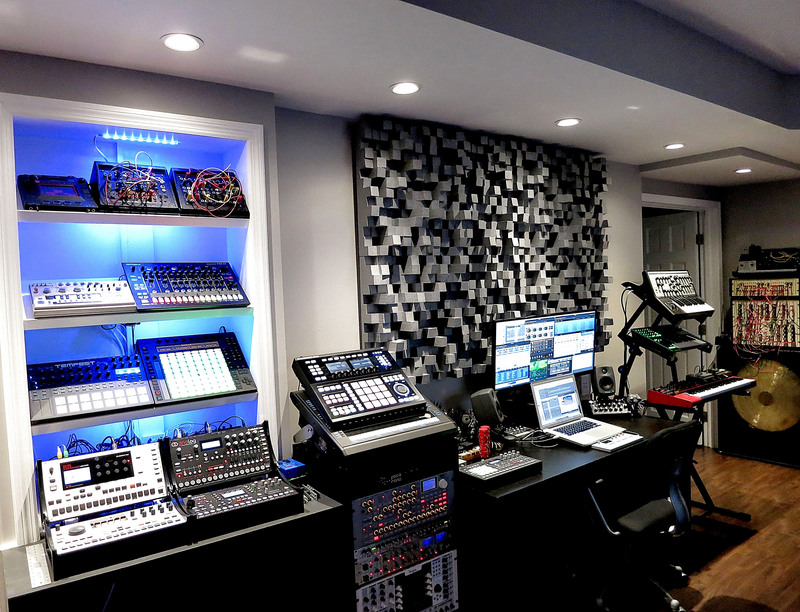 Devine is a sought out artisan and wizard of modular and DSP sound design, so it is a true honor to take a peak into his impressive studio, and share his thoughts on the process, working environment, and more! Enjoy! I got into composing electronic music back in high school. I was 16th years old when I first started building up a studio. I was buying a lot of records during this time. I was doing lots of DJ sets, with early Warp and Rephlex records. It was the music of Richard D. James that started it all for me. I got the “Mindstream” EP, of Meat Beat Manifesto, which had an Aphex Twin remix on it. I was completely blown away by that track. I began the search to find more tracks by him and other artists in this style, getting the Analog Bubble Bath Vol-3 and early Caustic Window records. I knew at this point that I wanted to make this type of music. My first piece of gear was Akai S3200 sampler. I had my heart on getting a sampler first so I could learn the basics about how to manipulate sound. It had lots of interesting features, key-groups, envelopes, basic digital synthesis, filters, various waveforms, plus on board sample editing capabilities etc. It was a great choice in terms of learning the basics about sound and also taught me to listen for things that could be used in a composition. I also got a few analogue mono synths like the SH-101, Arp Odyssey, and then got the Arp-2600 which was a bit turning point for me in learning about sound shaping and design. How would you describe your music today to someone who thinks they listen to everything, but in fact only follow the latest pop trends? Its funny I often have been asked that question recently, and I usually tell people that my music is a hybrid between Acousmatic electro acoustic music, and rhythmically structured sound effects. My wife had the best description of my music: “it sounds like giant alien insects gnawing on metal”. I went through 3 different major studio iterations, before I got to the setup I am using now. I tried to figure out with each build what things worked and what didn’t work. Trying out different speakers, convertors, pre-amps, sound proofing materials, and lighting. With my current setup I tried to find just the right balance of vibe and functionality, which proved to be the biggest challenge. My current setup is really refined; I tried to simplify the signal chain down to just a few key pieces. I actually sold a bunch of gear over the past year, and just stripped down to my favorite pieces of gear that I know really well. Almost everything I have now, is because I worked doing patch design or programming for. So I know these pieces inside and out, and can get any sound I need out of them very quickly, for my projects. The main setup is centered on a Yamaha DM2000VCM mixer, which isn’t what I mix down with but is basically a 56 input mixer that hooks up all my synths and drum machines. I then have two ADAT light pipe cards that connect to a separate computer (Mac Pro) that runs this with a RME UFX sound card. I can then route anything to anything with the matrix routing capabilities and at the same time use some of my favorite digital outboard effects processors like the Eventide H8000FW, and Lexicon PCM92. I will often use the mixer like a modular synth sending signals, and doing feedback chains coming up with all sorts of new sounds. The main use is to have a interface to track all my keyboards and synths into one source that is up and running all the time. Nothing to unplug, or plug its always up, and I can recall instant settings at the touch of a button. The mix down setup is very simple, which consists of Universal Audio Apollo 16 that is connected to a Dangerous Music 2Bus LT analog summing box. I analog sum 16 channels going directly out into the 2Bus then take the stereo output into a Avalon VT-747-SP for the final warm glue and finalized EQ touch up. The final mix then gets run back into my computer. I am doing most of my stuff on an iPad and Macbook Pro I love the Universal Audio plug-ins, and use a big chunk of them for a lot of my final mixes and design projects. My main monitors are the Genelec 8250’s with 7270A DSP sub. I also have a smaller set Genelec 6010’s with 5040A sub that I start my mixes out on. I then level check things on a pair of Avantone MixCubes, to hear if any thing is popping up in the mix more of a reality check in many ways, as most people will be listening to stuff on smaller systems. Then I do a final check in my car and on the sound bar to hear how the mixes translate on more conventional high-fi systems. 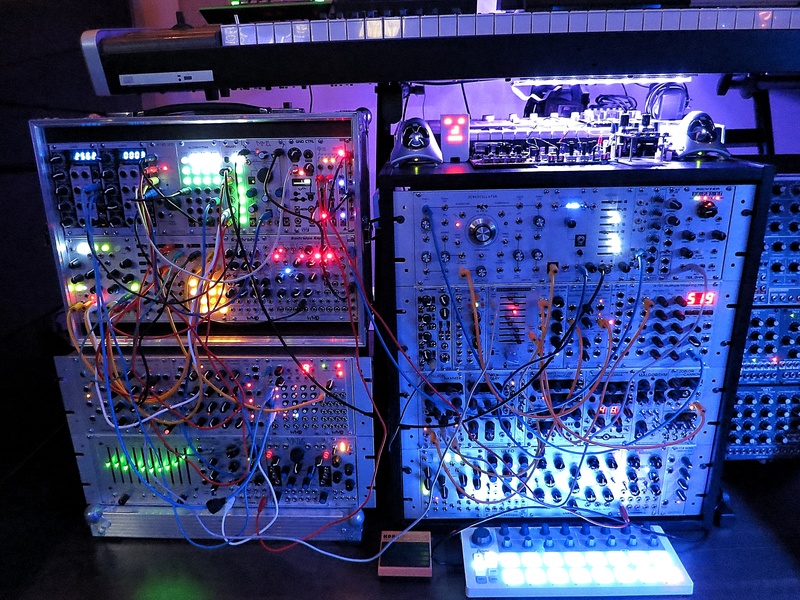 I would probably say my favorite piece of hardware lately has been my Eurorack modular system. I have found it to bring endless amounts of inspiration, in that you can create entirely new sounds, and new approaches to sequencing. It’s such an open-ended platform in that you can constantly change/update various modules to accommodate your creative needs. As for software I use lots of different stuff, but mainly use Logic Audio X, and Nuendo for sound design and music composition. I also have a Protools system here but only when a client request delivery in this format. I work mainly doing sound design stuff for most of the year, and use the new Pacarana Kyma system for a lot of stuff. I love Native Instruments Reaktor and Cycling 74’s latest Max/MSP 6.1.8 with Gen has been really awesome. I am looking forward to version 7.0 that will be released in the fall. I use Max a lot for just situational type stuff here at the studio. I also love Max For Live and was doing a lot of my shows with this and my Elektron Machine Drum/Monomachine setup. Some other favorites are Composer’s Desktop Project, Metasynth 5.4, AudioMulch, Plogue Bidule, Bitwig Studio, Crusher-X, GRM-Tools, and Spectrumworx. Well there is a few key pieces that I would love to have but not sure I will ever have is the EMS synthi-100 or the Waldorf Wave. I have played with both of these synths and I must say there is still nothing else out there that can do what they do. Maybe one day but it will just be a dream for now. Well my sound design work takes up most of what I do now. I work with many advertising agencies and technology based companies where I design sounds for hardware devices, software environments, TV/Film and video games. Some other projects have been designing sounds for GPS navigation system for a car, or a set of UI sounds for an iOS application. The video game market has been a recent cool area for me lately. I worked on three games last year. I have also been doing lots of film trailer work lately as well. I am hoping to get more into doing more film stuff later this year. Any particular new techniques that you have recently discovered? I have been playing around a lot lately with impulse responses. More in the way of using non-traditional sound sources as impulses rather then rooms and spaces. I will use objects, like cymbals, mallets, rhythmic pulses, or granular textures and then use the impulse file to impose the amplitude and frequency of that sound and convole it to the incoming audio. I have discovered so many interesting sounds with this process. I also have been playing around a lot lately with IZotope’s RX3 advance software. I love the spectral repair function in this. One thing I have been doing lately is taking tons of unrelated field recordings into a single audio file, then taking the audio before then after it and doing a spectral repair process. What is interesting is that it tries to analyze the audio before the file then after it. If you use two sources that are completely unrelated it will try to correct the sounds and give you the sum of them and add them into the beginning and the end. It’s also interesting using this same function but then inserting silence into an audio file then repairing the parts that have silence in which it will try to spectrally repair and glue those sections back together. What does your live setup look like, and what do you bring with you when you travel? Well recently I have been using an Enclave 12U modular case as I have moved over to doing complete solo modular performances. I also bring out a few guitar pedals, which include a Strymon BigSky, Eventide Space, Red Panda Particle, and M.A.S.F granular pedal called “Possessed”. I have purposely not wanted to bring out the computer as I wanted to explore what all could be done with the latest set of eurorack modules. In my current space I wanted to make sure I designed the room to have lots of space, and not feel too cluttered. 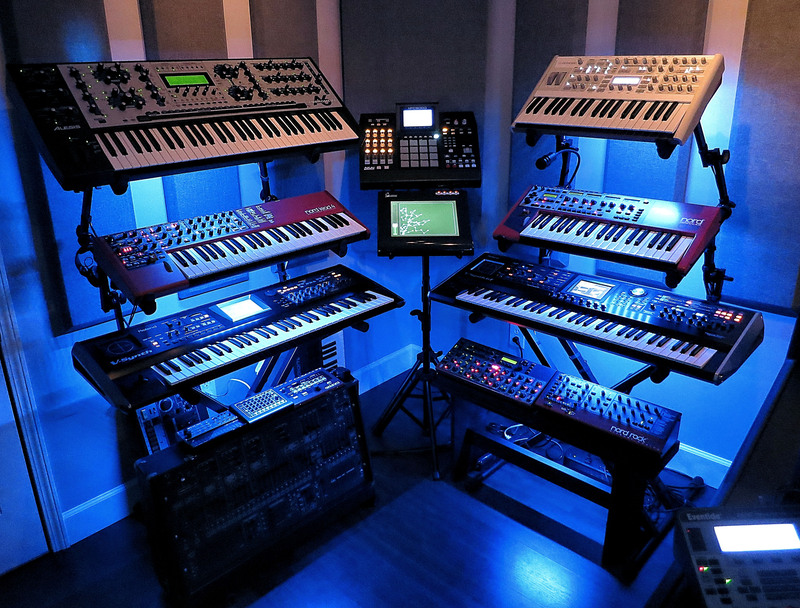 This was the main problem in my old studio, I just had too much equipment in there. I found it too cramped and claustrophobic to work in at times. I wanted to make sure the new space felt more open and clean. I tend to work better when I am using only a few pieces of kit at a time. So I wanted to minimize my setup and keep things simpler. I love everything about my current setup especially the new monitoring situation and the lighting. Being able to change the LED’s lights to any color or mood is really important. I feel that I want to work in darker lighting conditions later at night, and work in almost complete daylight like settings during the early mornings. 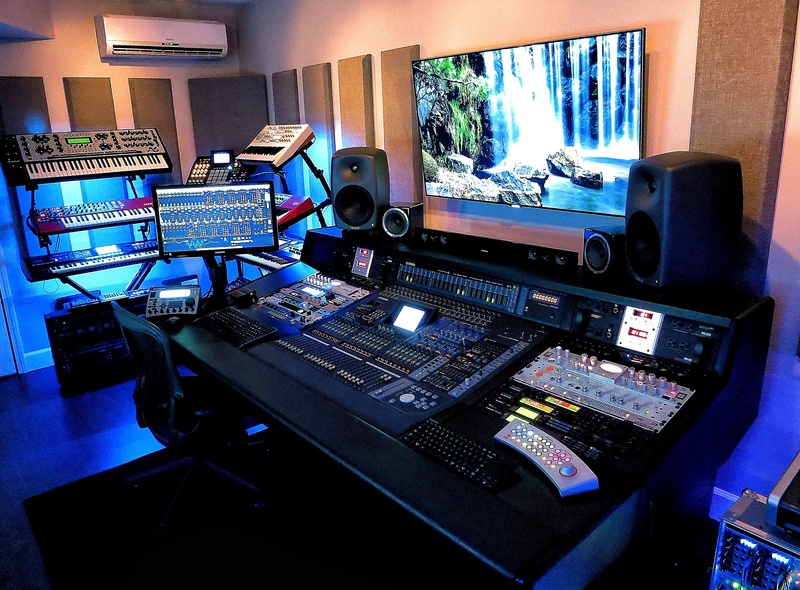 I have a big Samsung TV that I project my mix sessions but when not in use I will put images of outdoor forests, and mountain streams to bring a more outside organic feel to the room as I have no windows down here. My processes change all the time. It might start out with a collection of field recordings, or some sound that I synthesize in the computer. Lately I have been creating lots of patches on the modular and then recording alternate takes of the same patch. An idea might start out as me thinking of a certain sound then trying to create it on my system. The interesting parts for me are all the stuff that happens along the way. Something might accidentally happen while your patching and take you to an entirely different place, that wasn’t intended but is equally cool and inspiring. I will then record the patch in a series of performances, and pick out my favorites. This is quite different then what I do with computer music pieces, where I work more with specific events on a timeline. I will use a mixture of different plug-ins and instruments with automation to achieve a certain sound or mood. I tend to work on computer music pieces longer and sometimes spend months and months on one piece. Which I believe isn’t necessarily a good thing, in that you can recall a session from the past and rework things till they are perfect. I often find my self not getting much done, but re-doing sections that I feel could be better. I think this is why working on the modular lately has been better for me, in that I can’t hold on to anything for too long, as you can’t save anything, you just have to record it as is, and do everything in the moment with your current state of mind. I often audition the tracks, on a wide array of different speakers, in stereo and mono configurations. I will test on my laptop first, then iPad/iPhone for reference. I like to also play my tracks out on large PA systems to hear how well things translate. I also mix a lot of my stuff for the headphones, in that I will do a lot of stereo panning etc. People tend to hear the constant shifting of timbres sounds moving around between the stereo fields. This is something that I love doing, in that it seems to have a better overall affect for they type of material that I create. I do procrastinate from time to time, sometimes it happens If have a deadline coming up. I find that I work much better under pressure. I also try to spend a lot of my free time researching new technologies and instruments. I will get involved doing smaller sound design projects where I can work with new people, new tools, and software instruments. I find that doing some of these projects inspires me to do new things, and pushes me out of rut. Everything from nature, art, and photography, to architecture inspires me. I find inspiration in everything, which could be an art installation, musical software computer patches, or other musical works. 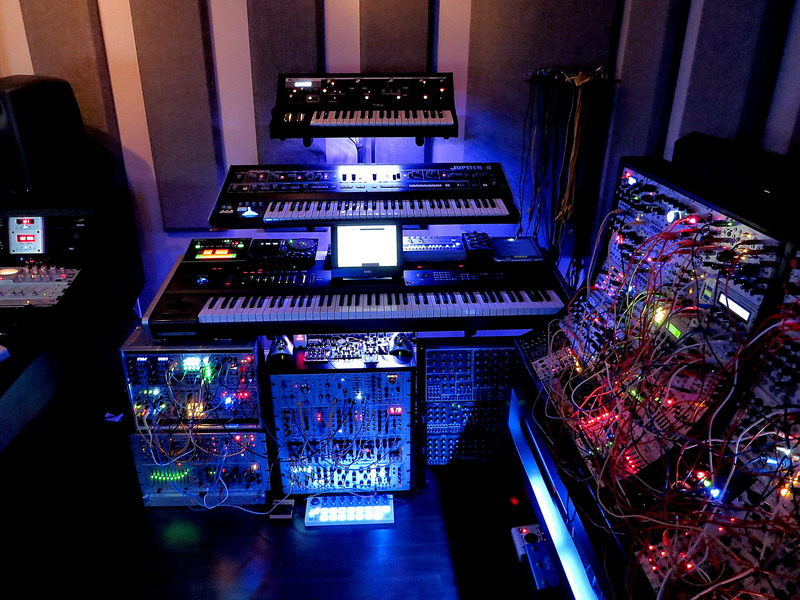 Another source of inspiration like I said above comes from designing sounds for new hardware and software. I am constantly looking for new tools and instruments to generate new sounds, and a lot of times these new tools that I design sounds for inspire me to do things that I never thought would be possible. I also love working with other sound designers on projects, which open your eyes to different techniques and approaches that you can learn from. Well, I think there is a lot more electronic music today then there ever has been, and now it’s taking the mainstream spotlight. I think now things get super popular very quickly and saturate the market for a year, then are out the next. So people’s attention spans are much shorter these days. The technology is partly responsible for this because everything can be downloaded or streamed immediately to your phone. I think people spend less time listening to full albums of music these days. I tend to have more of an old school approach. I still buy vinyl and listen to albums on my turntables to get the full effect. As for creatively I think a lot of newer electronic producers are just jumping on the current bandwagon instead of trying to do something new and different. Sometimes its cool to go against the grain and make something that you can call your own genre.